The first thing I have to “learn” is the language. Yes, you heard me well! Though we speak the same language within the country which is called Vietnamese, the accents in different regions are so distinctive that we have such a hard time understanding each other. On my first week at work I almost went crazy because I couldn’t get the correct email addresses of my clients on the phone. And my colleagues were making fun of me all the time with my “Hanoian accent”. The vocabulary is different as well. And I bet people here also have problem understanding me just as much as my problem understanding them. The second thing is the food. Southern food is sweeter and spicier than Northern. There are many popular dishes here I have never tried before in my life! My colleagues were joking me “hai lúa” (countryside) since I didn’t know what “hủ tíu bò kho” was. In fact, one of my flat-mates (my flat-mates are all from Hanoi or have been living in Hanoi for a long time) doesn’t really like Southern dishes but for me, I’m quite ok since I often favour sweet taste. The third thing is the people. Southern people are so different from Northerners. I really mean SO different! I hear that Southerners don’t like Hanoians, because we “invade” Saigon and form a huge community here. There are some places that will make you feel like you’re actually in Hanoi, e.g the area around Tan Son Nhat airport; and even in District 1, I hear Northern accent every day! Yeah, we come here taking too many good jobs, we are “stingy”, we are “not friendly”, we are “rude”, we are “insincere”, etc. Well, I’m not going to defend Northerners against that accusation because sometimes I myself think the same way. Sure thing I won’t exclude myself from the Northern community since I have been growing up in an environment where we don’t spend money in endless parties and shopping and where older people teach us to be obedient and polite (which to some extent has turned into fake courtesy, yes, that is the negative side). However, just to be honest, I’m not feeling comfortable when people here comment on my “vâng, dạ, ạ” (additional words to show politeness in Vietnamese language when you talk to older people) or when I sometimes leave a bit of food on my plate, or when I ask before using other people’s stuff though I know 100% they let me freely use it. I don’t think that is “insincerity”, it’s simply “different culture”, and so what’s the problem with that? Why some people have to laugh at us because of our different culture? What more? 3 years ago, I thought: woow, services in Saigon were way better than in Hanoi! Everyone smiled with you when you stepped in a restaurant and brought you an extra glass of tea or water compared with the grumpy face of the shop keepers in my neighbourhood in Hanoi. That was why I wanted to move to the smiling land of Saigon so bad! But now, once I really live here in a residential area and not wander around the touristic places, I can tell that my fancy has completely gone. Absolutely the sellers in a local market are not that friendly (once going to the market near my flat, I decided to count smiling faces in each food stand I bought stuff in, and the result was amazing: 1 smiling face out of ALL the food stands I visited), and the shop keepers in small convenient stores are also grumbling to me because I don’t use the correct “Vietnamese” word for a pack of 4 milk boxes. So, my flat-mates and I have come up with the conclusion that the service you receive depends on the money you spend, no matter you are in Hanoi or Saigon. If you go into an upscale restaurant in Hanoi then smiles and free glasses of water are what you get, and if you go into a little local shop in Saigon then grumpy faces are also what you see. As simple as that! However, to be honest (again), I like Saigon now as the way it is more than the way I fancied about it some years ago. Absolutely it is more real, more practical and I can discover the true reasons why I like living here. Yes, the weather here is not as tough as it is in Hanoi, the streets here are wider and people do not jump the lanes crazily like in Hanoi (although they drive on pavement and stop on the zebra crossing more, but that also means that they DO have free pavements in Saigon which are not turned into parking lots like in Hanoi). There are more entertainment activities to do, however, shame on me that I have been spending much more time sitting in front of the computer than going out..
Those above were just some factual notes from my life in Saigon. And please don’t try to persuade me otherwise because I’m living here and seeing things by my own eyes, not hearing through friends. In conclusion, I have some words to those saying they hate Hanoi and never want to go there (either Vietnamese or expat), also to those who only live in Hanoi, come to visit Saigon once or twice then say they will never move to Saigon: “Don’t trust what you hear, and don’t trust your feelings when you are just a tourist; don’t do a city tour and say you know the city. You never know it unless you really live with it”. This one last sentence is a bit off topic, but my advice for friends that were planning to live in India then somehow changed their mind because of external factors such as “experience from friends and relatives”: the majority of people’s opinion may not be applicable to every individual; and whether you will like it or not, it’s always a new lesson of your life and it’s worth every try! Really interesting post! I’m afraid I’m exactly one of those Hanoi expats who says “I would never live in Saigon” based on a few short visits. I like to think this is mostly just me being a proud Hanoian, but you’re right – it’s actually just ill-informed. Hope to read more posts of your life in Saigon! Interesting post babe! I guess the feeling you got above was coming from some certain individuals. As a representative of new generation, i do not see much difference. Its just how we put it, how we experience it in our own way. Honestly, i do not wanna say it…but a big lesson that we, Vietnamese still need to learn from Chinese is consolidation. time and efforts should be spent on contribution to the development of the country rather than discrimination on our own folks. Anyhow, life is not perfect. we could not expect every single person to treat us as how we want, instead the positive change could be starting from us [quoted by AIESEC]. how do you think? =) Lets give a smile to them first, have the love spread out, i am sure they absolutely have NO reason to be angry with you. Thats how i did in Hanoi to get their smiles in return. ps: again, nice post babe. we should catch up sometime soon. and let me know if anyone here ever bullies u hehe. I went through the opposite. Never liked Saigon as a tourist (hated it as a typical Hanoian) but grew to love it once I got to know it as a local rather than a visitor. Perhaps I has never been a proud Hanoian and if a city offers me what I cannot have in my home city, I will fall for it. Anyway, I’m glad that you took on this chance to get to know the other side of Vietnam and found out more about yourself along the way. I asked question on another post of yours and still would like to know “on demand” because now I know your are a native Hanoi citizen. >> Why so many women/girls everywhere in Hanoi? As you been to India just imagine from view of an Indian! I never ever saw these many women/girls working in a city everywhere. It was a no MAN’s land city for me. Haha !! why is that? I barely saw men in Hanoi at garages or as taxi or bus drivers. Oh my god it’s a mystery to me!! Due to this I was unable to judge if it’s a men’s cloth shop or ladies cloth shop in few occasions. I was most times staying near Hoan Kiem lake area. Not sure if it’s because of area or what. After visiting Ho Chi Minh museum in Hanoi I felt I should really explore more Vietnam. A different country than other south asian countries with it’s unique culture,life style,food & politics. I would like to mention, former prime minister of India “Pandit Jawaharlal Nehru” met Mr.Ho Chi Minh in person. Mr.Nehru was on Vietnam tour that time. I was surprised a bit to see that photograph but it was interesting! Apart, I never ever heard about any political realtionship news between Vietnam & India. But may be recent conflict between China & India regards to land/area in South china sea can improve political relationship between Vietnam ~ India if Vietnam opposes China on this issue. Recently China claimed some portion of South China sea as their property where India has oil mining set up’s. I am eagerly waiting to read comment of Vietnamese politicians on this conflict. Hello, thank you for such an interesting post on the differences between Saigon and Hanoi, I really appreciate you sharing your experiences with us. I was born in Saigon and never have been up North but people in Saigon always said that I have a very Northern accent so I was acting as an honorary northerner for quite a while so I can kind of understand some of the things that you experience. By the way, you use the term zebra crossing, isn’t that a crosswalk? Zebra crossing is cute though, I wonder where that phrase came from. Got to say this, it was totally amazing and yet helpless at the same time i was there. The “ants of motobike” zig-zagging around. i have never seen so much two wheelies zoooming around all at once everywhere especially in tourist area, District 1. The Hotel that i am staying “kindly refuse” to rent me a motobike saying it take more than a driving license to drive in the city. So the initial two day, i did a lotss of walking until i barely can walk anymore. Lucky i have a “good kind female friend” which i have no choice but to call for assistance. I love the streetfood very much especially the snailsssssss! Still i need to “learn” vietnamese language if i were to visit Saigon again alone. It’s definitely true, even for Vietnamese people. Actually, your last sentence is very much on-topic. If people have only visited a place for a short time, their experience of it can be radically different than the next person. Therefore, don’t take it as conclusive. My friend didn’t have a good experience travelling alone in Hanoi, but really enjoyed Saigon when I was with him. Not sure if it would have been the same if he were travelling solo. For example, I like Beijing, but he hasn’t had as good an experience as I, probably because he does not speak Mandarin. Even with people who have lived in a place, you should also realize their perspective can be biased or limited. When I lived in Hong Kong, I made a point of going to all parts of the territory. (There are still places there I need to visit.) Most of my Chinese office colleagues had no idea the places I went hiking in Hong Kong even existed: http://ow.ly/c8YRe. One even had to ask me how to get out to the University of Science & Technology, even though he had lived there all his life! It just goes to show you that it’s good, every now and then, to go outside of your routine and do something different, even if it is just walking in the opposite direction of where you normally go. Thanks for the interesting comments! Miên ơi, bạn làm về du lịch hay là một người đam mê du lịch Việt Nam mà sao nhiều bài viết thú vị quá, lại viết bằng tiếng Anh nữa. Chúc mừng bạn. Mình cũng đang thử làm một blog giơi thiệu về những chuyện lạ về du lịch để giải trí cho chính mình. Hi vọng được hỏi học từ các bài viết của bạn. Your English is excellent for a Vietnamese native living in Vietnam! I was born in Hanoi and left at a very early age to Australia. However Hanoi will always remain the most special city for me. I consider it my hometown and I love it very much. Your views are very interesting, I went through the same experience when I moved to Australia. I was surrounded by Southern Vietnamese people, their accent was completely alien to me, as well as their food, culture and customs. I went through a serious identity crisis when growing up because I didn’t quite identify with the Southern Vietnamese culture here in Australia. I also didn’t identify with Australian culture. I was stuck between 3 worlds. Since most Vietnamese people in Australia are Southern Vietnamese, their culture defines what Vietnamese culture is here, so when growing up I rejected being Vietnamese, because I thought to myself, “I am not like them, I don’t speak like them, their Vietnam is different from my Vietnam, their culture and accent are different. Their food is different as well. So why do I have to be lumped in with them?” I actually identified more with Chinese culture because I had some Chinese friends who also moved to Australia at a young age like me. I honestly think Hanoian culture is closer to Chinese culture than Southern Vietnamese. We have the same work ethics (Southern Vietnamese value living for the present, they are less “ambitious”) , Confucian values (respect, politeness etc), frugality yet we do not hesitate to buy the best quality goods and when giving gifts we would give the most expensive gifts, even fake courtesy and flattery. Also when it comes to food, we prefer smaller portions since we consider smaller things to be more elegant and polite, cutting everything into very fine pieces which is why all dishes originated from Northern Vietnam have ingredients that are very finely sliced eg bun thang, pho. We are more flowery with our words whereas Southern Vietnamese speak straight to the point and very direct. My family actually thinks Southern Vietnamese people are a little “vulgar” because they don’t think before they speak, they speak their thoughts and are more honest… which is actually a good thing. It’s funny how you thought Saigon was a nicer city than Hanoi, I actually thought the opposite the first time I returned to Vietnam for a visit. Saigon was very hot and polluted, the city smelled very bad and there were less trees than Hanoi giving it a more chaotic feel. I actually felt more relaxed when we arrived at Hanoi from Saigon. As for accent, I prefer the Hanoian accent, it is much more softer and quieter than Southern Vietnamese accent. I like how we pronounce words like how they are written except for some consonants that were soften to make our speech softer. Our accent is much more “lighter” since we speak with the front of our mouth whereas Southern Vietnamese speak from the back of their throat. Southern Vietnamese sounds very whiny to me, I actually cannot tolerate it in movies. Anyway, it may sound like I am anti-Southern Vietnam but don’t get me wrong, I am not bashing SV, I’m just saying what I have observed from my experience here in Australia. Hey thanks for sharing your experience. Honestly speaking, I think that Hanoi culture is more Chinese and French while Saigon culture is like Khmer and American, that’s why they are different :-). It all goes back to the history of the country, but well, that’s a long story and I’m sure you already know it. One of my American expat friends in Hanoi said: Hanoi doesn’t feel South East Asia to me, it feels like China, but Saigon is South East Asia – I think her point was interesting. 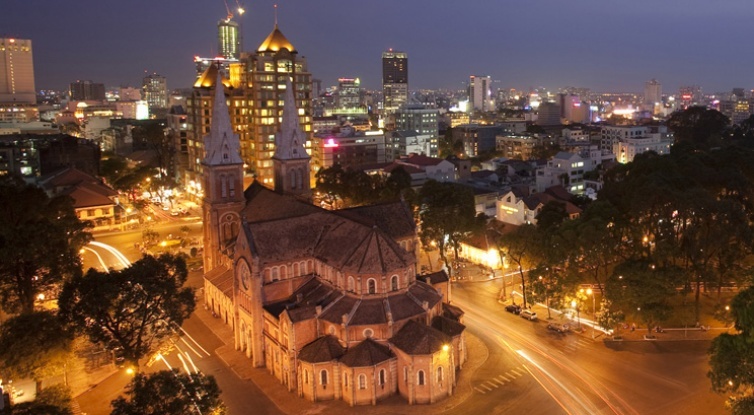 I agree with most of what you said, just that I never really stated in my post that Saigon was a nicer city in Hanoi, what I meant was Saigon was a lot more modern than Hanoi (of course). There are people who prefer Hanoi to Saigon and the other way around, it just depends on their own personalities.